In choosing a ring setting, it is important to consider the type and size of gemstone, your lifestyle and your budget. Because rings are subject to knocks and blows, softer gems need to be well protected, particularly for active people. In a prong setting the gemstone is held in a metal head or basket by several prongs or claws. Each prong is typically notched to provide a seat for the gem. Then the prongs are pressed into place to hold the gem securely. 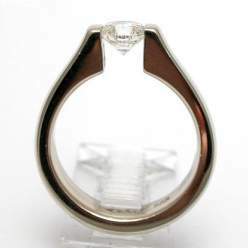 An oval or round stone is usually set with 4 or 6 prongs. The advantage of the prong setting is that it exposes most of the gemstone to the light, and thus maximizes a gem's brilliance. Since the prongs are quite small, they require little precious metal, and they are fairly simple and easy to manufacture. It is also relatively easy to clean a gem set in prongs, since most or all of the gem is accessible. Prong settings are most appropriate for very hard gems, such as diamond, ruby, sapphire, chrysoberyl and spinel. Any gem with a hardness rating less than 7 on the Mohs scale would be not be a good candidate for a prong setting, unless the ring were intended for occasional wear. Since so much of the gems is exposed, and its possible to snag the prongs on objects, prong settings are not ideal for active people. A bezel setting consists of a rim or collar that surrounds the gemstone, usually exposing only the top or table of the gem. This type of setting is more protective, but requires additional metal and labor to produce it, since the bezel must be custom made to fit the particular gemstone. Though less light is allowed into the gem, this kind of setting is often used for opaque or translucent cabochons, and softer gems such as as sphene, opal and diopside. In the bezel setting the mounting becomes a critical part of the ring design, and the type and style of metal becomes very important. There are variations on the classic full bezel which only partially encase the gem, as in a half-bezel or a bezel with a lower profile.. Some ring designs mount one or more gemstones flush with the band, either by setting the stones in tapered holes in the metal, or by setting the gems in a recessed channel. The former style is sometimes known as a gypsy setting, while the latter is referred to as a channel setting. In a channel setting a row of gems is usually set with no metal separating the stones. If the gems encircle the entire band it is known as an eternity ring. The flush design is even more protective than the bezel. and the gypsy setting is especially popular for men's rings, since it is clean and simple and unostentatious. 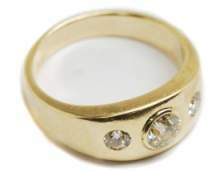 Channel settings are often used in wedding bands and for setting side stones, as well as in the popular eternity rings. A tension setting is a recent innovation that appears to suspend a gemstone without any visible means of support. In fact the gem is held by the pressure of the metal band. A tension setting has to be specially constructed for a particular gemstone, and only very hard gems -- diamond, sapphire and ruby -- are durable enough to withstand the extreme pressure. Because each tension setting is a custom job, the cost is higher. And it is not possible to resize one of these rings once the gem is set, since the metal is exactly calibrated to produce the right level of compression to hold the gem. Though a tension setting may look precarious, in fact they are very secure. Usually small grooves are placed in the metal to hold the girdle of the gem, and the pressure is applied evenly to both sides of the gem. 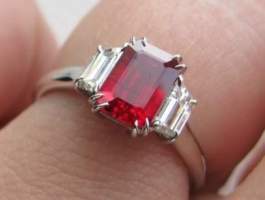 As long as the spring loading of the metal is not lost, it is nearly impossible for the gem to come out of the setting.